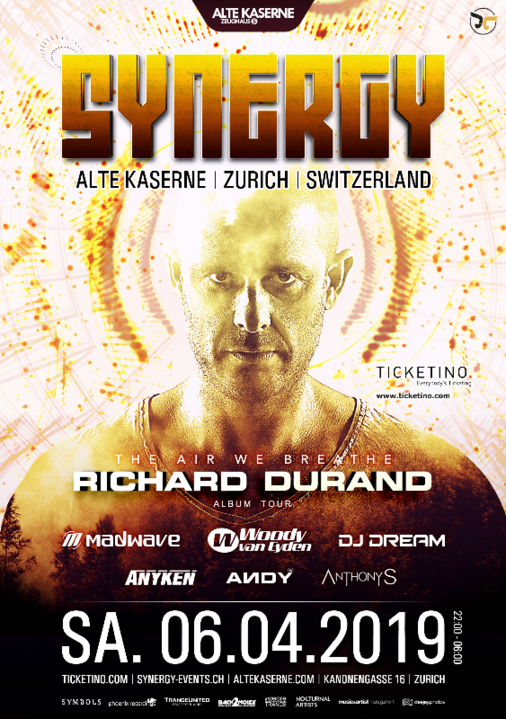 Author of the A State Of Trance ‘Tune Of The Year 2018’; SYNERGY Events is excited to welcome the Trance hero Richard Durand headlining this next main event! We also welcome another Dutchman giving his debut to perform at the Alte Kaserne: Mr. Woody van Eyden! 🚀 As usual, a fine selection of local Swiss artists will support the event and the guest DJ's. Our SYNERGY (p)resident and internationally successful DJ and producer Madwave is leading the pack concluded by the infamous fire detector conqueror DJ Dream, Zurich's own Anyken, the 'mix machine' ANDY and last but not least Ticinesi DJ/producer Anthony S Official who is making his way to Zurich from the Italian part of Switzerland for his SYNERGY debut! ❌ EARLY BIRD incl. giveaway - SOLD OUT!